Summer’s here! It’s my favorite season, even in steamy Florida. Sunsets at the beach, sipping cool drinks, reading a good book – that’s what summer means to me. In honor of the “school’s out, let’s relax” mentality, this post is a little different. Rather than share a green business story or tip, I’m sharing the story of a good friend, Tim Grahl. Tim runs Out:think, a company that helps authors sell more books in this digital age. Authors from Pam Slim to Daniel Pink have all landed on the New York Times best sellers list with Tim’s help. Tim Grahl knows helps authors sell more books. I met Tim at a conference for entrepreneurs a couple of years ago. He spoke candidly about his business. For example, one of his challenges was dealing with clients who asked him to work for free. Tim – who is one of the nicest guys you will ever meet – startled me out of my seat by saying, “If they [the prospect] don’t want to pay you, “F*** them.” (Pardon.) The wisdom in that remark is with me every day. 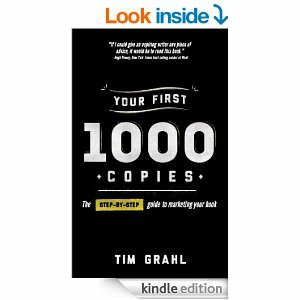 Earlier this year I was intrigued when Tim publicly committed to selling 10,000 copies of his own first book – Your First 1000 Copies: The Step-by-Step Guide to Marketing your Book – by June 27, 2014. As of this writing, he stands at 8770 sold. A bit short of his goal. I bought his book and read it. (8771, Tim!) And I recommend it. Because so much of this short book is just about good marketing in general. His “Connection System” and the notion of building an audience before you write your book are truly marketing philosophies for the future. So if you’re interested, pop over to Amazon and buy his book now for 99 cents. I get no part of that; I just think you’ll enjoy it or may know someone who will. Tim Grahl is one of the “good guys.” He has emblazoned the phrase “be relentlessly helpful” on my brain. He made me a better business person. And for that, I’d like to help him reach his goal of 10,000 books by June 27. There’s no pressure – I just want to help get the word out. It’s a way to start summer in a positive, “pay-it-forward” kind of way. And if you DO buy, you have my thanks! I was in Denver, CO last week, attending the first-ever live event from the Copyblogger.com folks. Their “Authority Intensive 2014” was sold out. It may be the best conference I’ve attended on copywriting and content marketing. The Authority Intensive 2014 conference offered the latest on content marketing. My brain was exploding (in a good way) by the end of the first day. As an online writer (primarily), it’s good to remember that content fits into a larger “content ecosystem.” Here are 4 key takeaways for how any business – especially those building green(er) practices into their operations – can use content effectively to reach business goals. Know your readers/customers – This goes without saying, but it’s easier said than done. Inspired by the conference, I’d love to know more about your business – at whatever stage of “green” it is. What is your biggest content problem as either a green business or as a business working to become greener? Tell me at alueders@verizon.net. I’ll keep it confidential, and I’ll send you a $5 Starbucks gift card for your trouble. Tell true stories well – This is particularly relevant to businesses that are “green” or becoming greener in their operations. Stories about how your business is going green moves those actions out of the realm of “scammy” or “scary” or “confusing,” into something understandable and doable. Become a trusted source of updates on what your are doing to become more sustainable, and people will both pay attention and emulate you. Re-purpose your content – I’ve said this before, but it’s nice to hear the experts say it too. If you’re a big guy, your Corporate Sustainability Report is a treasure trove of potential content. If your business is medium or small, your green actions – however modest – can be the basis for an infographic, a blog post, or a separate web page about your company’s sustainability actions. Focus on “useful” – Green businesses and those going greener have an advantage. Contrary to popular belief, many “green actions” – from installing LED lights to conserving water – save energy, emissions, and money. I don’t know a business that doesn’t care about saving money. Share your useful knowledge of greener practices with other businesses or consumers. It enables them to act. And since a business’s journey to green usually takes time, you will always have new green actions to talk about. More than ever, original content is foundational to your green business success. By telling true stories about your green actions and how your customers benefit, you extend your reach and build trust in your brand. Over time, that trust becomes money. 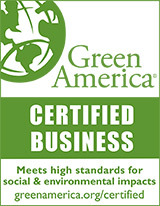 Ready to let my green business help yours? Contact me at 813-968-1292 or email at alueders@verizon.net.